What Can We Do For America’s Most Challenged Cities? My latest Manhattan Institute study was just released, discussing the particular difficulties facing America’s most distressed cities. Post-industrial metro areas with less than one million people that have experience significant decline are in a different category than other places. In addition to demographic and employment challenges, they tend to have low end economies, low levels of educational attainment, and very few elite caliber assets such as an R1 research university around which to rebuild. I suggest that speculative economic development projects and subsidies are unlikely to work at reviving these places because the market is fundamentally against them. Rather, they should focus on building the preconditions of success by fixing their finances, reforming their governance, and rebuilding public services. This will require significant state, and perhaps some federal, assistance for them to achieve. Click over to read the report. What cities are we talking about here? If you ask someone to name a left behind industrial city, you’re likely to hear places like Detroit or Cleveland. They have challenges to be sure, but also much that is positive going on and, more importantly, they have high value assets around which to build a 21st century economy. Detroit, for example, has nine Fortune 500 headquarters, a major concentration of engineering talent, and is a hub for Delta Airlines with non-stop flights to Europe and Asia, among many other things. The truly left behind and most forgotten cities are smaller places, many of which are little-known: Danville, Illinois; Johnstown, Pennsylvania; Michigan City, Indiana; Pittsfield, Massachusetts; and Youngstown, Ohio. These metropolitan areas often have several strikes against them, including population loss, weak job markets, low value economies, a low share of adults with college degrees, and a central municipality that is financially distressed. They also have very few if any high value assets to rebuild their economies around. They usually aren’t state capitals and lack elite universities, Fortune 500 corporate headquarters, a major airport (or any airport), and name recognition. Instead, deeply challenged smaller post-industrial cities should do the basics: Local governments must address their often huge unfunded liabilities and get to structurally balanced budgets. They should reform their governance where necessary, especially by eliminating corruption. And, they need to start rebuilding core public services, especially public safety but also parks, etc. Make no mistake, this will require help from federal and state governments, and may involve painful steps like bankruptcy and prosecutions. This is not giving up. It’s exactly what New York City did before its comeback. When a financial control board helped it recover from its 1970s brush with bankruptcy, the city put in place a new charter, fought corruption, and started investing in its subways and rebuilding Central Park. It’s also what Detroit did more recently in addressing its financial plight through bankruptcy; creating regional authorities or taxing districts for its water system, convention center, and art museum; and replacing all of its streetlights. It’s what former Syracuse mayor Stephanie Miner said she would do if Governor Cuomo gave her city the same billion dollars he gave Buffalo, proposing to spend three-quarters of the money to repair the city’s water system. With a mayor of one of the cities you include now rising in the presidential race, it’ll be interesting to see how much, and how, all of this comes up during the campaign. I’m also curious if, at some point, Pete Buttigieg more expressly advocates for people like himself to do like he did — take your Harvard and McKinsey background back to your hometowns. Maybe the worst places are beyond help. Maybe the best thing we can do is to provide special support for people in those places by declaring them “economic disaster zones’ allowing governments to buy out home owners so they can leave. Renters can get grants to move. Isn’t it cruel to string residents along in a place that has lost it’s economic rationale and hasn’t managed to create a new one for a generation or more? Sure, and in another quarter-century we can pay them again to move out of Lubbock, Chattanooga, Sioux Falls and wherever else they’ve been transported once those places start to fail as well. We can just keep shuffling the working and underclasses around at government expense until we run out of new places to desiccate, and have to send them back to the slightly contaminated, tell-studded prairie once known as Gary, Indiana. Or we could stop undermining these places by letting the government subsidize their competition near (suburban) and far (Sun Belt). But when that gravy train is threatened, only then will you hear the wailing and gnashing of teeth about redistribution and government picking winners and losers. Anybody remember the “Agenda 21” freakout from earlier this decade when we had a mildly pro-urban President and central cities were doing better than anyone thought they had a right to, mostly under market conditions? Those who can already do leave for greener pastures. And so far as I know, the Obama administration saw only deterioration in urban Youngstown, Dayton, Peoria, and other places like it. Most people don’t live in closed access cities. It took east coast cities from the 1970s to the early 2000s to find a new economic model that works for them. But, that happened only once it became clear that those metros could respond to the changing economy. Places don’t fail because they have the wrong infrastructure, demographics, or collection of businesses. They fail because they are unable to act in credible ways that create the right infrastructure, demographics, and collection of businesses. Cities don’t fail because of their form, they fail because of their function. Chicago is not failing despite it’s unfunded liabilities because it’s been able to respond to economic change. Chicago is still able to adapt. If you show that you can still be relevant, people will still invest their time and money. If you grandstand, deflect, obfuscate, and draw lines in the sand to defend at all costs…as in a city that shall not be named…you fail. One of Buttigieg’s frequent talking points is that he had to essentially institute a change management program, particularly with older residents, to get them to accept basically that Studebaker wasn’t coming back. And only then could the city and its citizens think creatively and effectively about economic development. South Bend has a long way to go, but I was there recently and at least you can detect a pulse now. One other thing that’s been critical for South Bend, and the whole South Bend-Elkhart area — immigration. There’s been steady growth in immigration, particularly from Mexico. Not to be overlooked is that the region is still really dependent on one manufacturing industry (RVs, centered in Elkhart, the next county east of South Bend). That industry has been riding high for the past few years and supports a large supplier ecosystem that helps South Bend. But it will cycle down again as the Boomer wave crests (and with the next recession). Northern Indiana will see yet another bust. I keep harping on this: Indiana and Wisconsin are the two states at the top of the league tables for manufacturing. Both have a slew of small cities and a couple of bigger ones built around smokestack industries. Both continued to double down on manufacturing. Over the decades from 1980-2010, Indiana succeeded in luring four big vehicle assembly plants from four manufacturers. Only two went into bigger metro areas (Fort Wayne and Lafayette) and those cities are doing well. They also support clusters of component plants. The old mid-tier union towns of component factories (Marion, Anderson, Connersville, Rushville, Muncie, South Bend) didn’t win the auto plant lottery and have had limited success attracting new component plants. Kokomo and Columbus continued to attract jobs and Aaron has highlighted both as success stories in recent years. Bottom line: Mayor Pete had plenty of examples both good and bad in his home state. He’s smart enough that he looked south for guidance. Curious what will happen once the mobile sloshing oceans of capital realize that many of the glorious new internet companies will never be profitable? (Uber and Lyft have no path to profitability except by raising prices and slashing driver incomes…and even there,,,it is doubtful). Too many coastal cities are becoming very much one industry towns. We already forget the Dotcom Bust. Same thing that happened with Pets.Com, I guess. More seriously, at some point in time a Mitt Romney type buys Uber at fire sale prices, patent trolls lawsuits, raises prices and pulls out of unprofitable metros. While that area has a ticking time bomb in it’s reliance on RVs, one that is in the process of detonating, there is a strong program of place making in Elkhart and to a greater degree Goshen. Places, programs, and arts are very strong thanks to a couple decades of little programs supporting Goshen’s small but attractive downtown. Goshen is a place a people choose to live in. South Bend on the other hand largely took the silver bullet approach, with the Century Center and College Football Hall of Fame (rip). Unfortunately placemaking and arts jobs don’t have the supplier multiplier effects of manufacturing jobs/investment. Yes indeed I’m a dreamer so here goes: These smaller places will always have land. Reinvent – or rather revert – the food system to a smaller, regional and sustainable scale. Honestly, I wonder if the Vermont incentive program for remote workers that was introduced last year is a more realistic example of a way to stem the tide for smaller towns than anything from an infrastructure perspective. Corporations are accelerating consolidation into the very largest markets (whether it’s finance in NYC, tech in the Bay Area and a handful of other favored destinations, or Midwestern headquarters in general in Chicago) to the point where a smaller town that doesn’t already have a key asset in place (such as a major university) essentially has no chance to compete for large institutions to move operations there. However, maybe *individual* remote workers that have the ability to live anywhere could be convinced to move elsewhere for quality of life, lower housing costs, etc. Granted, the history of telecommuting over the past couple of decades has shown that remote workers end up wanting to still move to superstar cities anyway (e.g. telecommuting spurred more people living in Buffalo for work to move *to* NYC as opposed to the other way around), but it’s at least an argument for place that offer other amenities (such as the natural beauty of Vermont, etc.). Convincing a tech company to have any substantial presence in the forgotten small towns is wholly unrealistic, but maybe they can pick off a critical mass of individual remote workers where they have total freedom on choosing where to live. Part of the problem is that the job areas are becoming increasingly fewer. Yes, the very low total makes the % extreme, but still, why did CA produce so many the entire rest of the country so FEW?? No matter how expensive the Bay area gets, it still grows jobs – LA too. Atlanta continues to grow and the big Texas cities etc. You would that they would see some benefit to putting something in Youngstown, but they don’t. Problem is, there is NO advantage to “putting something in Youngstown” unless Youngstown and Ohio make someone a hell of an incentive offer. And even then…see HQ2. Would a UBI help these places? Sometimes I think that the best thing these places have going for them is dirt cheap urbanism. It would be interesting to see the top 25 metros receiving SSI/SSDI disability payments (expressed per capita). There is an unproven hypothesis that SSI/SSDI functions as UBI. Anecdotally, the recipients generally tend to be non-working working class people…the “left behind”…but I’d have to see significant overlap in the “league tables” for SSI/SSDI per capita and Aaron’s list of left-behind small cities to believe it. Acronym for Universal Basic Income. Yes, there are advantages – a hell of a lot cheaper for the company and a much lower cost of living for employees. Part of the reason these areas are distressed is due to the toxic legacy former employers have bequeathed. Youngstown has some of the worst air quality in Ohio. Lead level in public water in Johnstown is higher than Flint’s. Michgan City’s ancient coal-fired power plant continues to impact the health of residents, particularly minorities who live in proximity to the plant. The long-running clean-up of Pittsfield’s Housatonic River seeks to mitigate GE’s pollution. Who wants to live in places that are dangerous to one’s health, that have lost meaningful employment opportunities and seen an erosion of civic pride? Coupled with Aaron’s emphasis on fiscally responsible management and corruption-free governance, I would add “anchor” strategy + landuse/zoning updates + incremental development. Surely all of the cities mentioned have “anchor” institutions – firms with deep roots in the community that buy lots of goods/services, own lots of land, employee locals, etc. (Banks, healthcare facilities, schools K-12 + community colleges, public libraries etc.) Enlist these entities to undertake an asset inventory of 1: natural features – including lakes, rivers, woodlands, agricultural land, brownfields; 2: educational institutions; 3: residential/commercial building stock; 4: parklands/greenspace. Rebuild the civic infrastructure in a way that engages the population in the locality’s rebirth: planning charettes, tree planting/beautification projects, public displays and hearings. All schools (public and private) can be enlisted in the effort as a way to engage and educate youth about how local government functions and what local government can accomplish that improves people’s lives, and stimulate thinking that the region might actually have a self-directed future. Allies can be enlisted from the state’s land-grant colleges and/or state schools. In Indiana, Ball State landscape architecture and/or city planning/architecture students often lead design projects for cities/towns around the state. Indiana has a Master Gardener program managed by Purdue in affiliation with county extension agent offices. Unity Gardens in South Bend is a great example of the kind of civic pride that can be built around urban horticulture. The Children & Nature Network’s “No Child Left Inside” slogan should be the guiding mantra. Get young people physically engaged in their community through tree plantings & beautification projects and reinforce those actions with classroom work that ties this in to STEAM curricula. Once the building stock assessment is complete, enlist allies from Association of General Contractors affiliates. They are looking for the next generation of workers in the building trades and often have apprenticeship programs. Get young people or mid-lifers or retirees to learn a valuable skillset in on-the-job training that immediately improves local building stock. 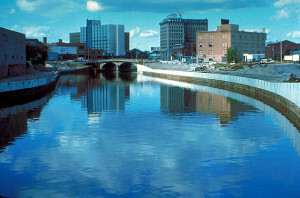 These programs can be contribute to the upgrading of housing stock for existing residents (some of whom no doubt need basic repairs or improved energy efficiency to immediately improve quality of life – often at costs below $1000) and generate “quick wins.” Similarly, adaptive reuse of commercial structures into mixed-use, mixed-income facilities can demonstrate to residents that good things are happening for people they know, in places they are familiar with. It generates momentum to do more and helps rebuild civic pride which is an essential ingredient for reanimating a community, making it someplace you want to live not just be stuck in and helps attract new interest. Update landuse/zoning reqs to foster compact urban development that provides citizens options to walk, ride bikes or take transit. Depending on the area, a No Development green belt like Portland OR’s might be in order to stem the spread of sprawl. Complete Streets typologies can be implemented as streets are repaved. Make parks/greenspace a priority over parking lots and pavement. Yes, it will take government funds (federal, state & local) as well as grants from the philanthropic/nonprofit sector. How those funds are deployed and to what ultimate end should be part of the charette conversation from the outset and subject to on-going community engagement as the plan is implemented, refined and updated. A five-year plan encompassing some of the above could be short-term enough that a middle school student today could graduate from high school in five years in a town that has made significant improvements that they contributed to. Sadly, one of the other problems with the “oligarchyization” of American society and economics is the loss of local anchors. Growing up, my hometown had multiple large local and regional banks, local and regional department stores, and local and regional supermarkets. Now it is all Wells Fargo and Walmart and Krogers. Sure, branch plant managers get “involved”, but I doubt to the extent the Maloleys’s family (supermarkets) did. Agreed. Aaron has written about how rollups have affected second-tier cities; he and I discussed it quite a few years ago. While the Fort Wayne GM Truck Plant general manager is pretty important at GM and to his/her workers, I’d bet s/he is virtually unknown in the metro area. Maybe United Way or Lutheran Health or the Community Foundation has roped him/her onto their board. I don’t want to downplay the successes in Fort Wayne. There is new energy downtown-I would have never guessed that one of the ugliest 1960s bank midrises would house hip condos and a booming tap room. And, if they can pull off the reuse of the old General Electric plant….that will be a wow story! and sometimes, it is outsiders who have the ideas and connections and skills. I understand that the company leading the Electric Works project is from North Carolina.